The Evenflo Maestro Booster Car Seat is a harnessed car seat that is forward facing. It is made to hold children from 22 to 50 pounds with a height of 28 to 50 inches. It can be converted to a belt-positioning booster seat for children from 40 to 110 pounds with a height of 43 to 57 inches. This car seat also has a 4 shoulder harness and 2 crotch strap positions. The Insurance Institute for Highway Safety accredited it as the "Best Bet" because of the adjusting belt path that assists in properly positioning the vehicle's lap shoulder belt that goes across your child's shoulder. This car seat has withstood approximately 2 times the energy of the Federal Crash Test Standard. It also went up above Evenflo's own side impact test standards. Other features include cup holders that have flexible bands that will help to keep snacks and drinks in place. As of this writing, the Evenflo Maestro Booster Car Seat has 1,594 reviews left by people who have bought this item. I've read the reviews and condensed the main topics into what the majority of the parents were saying. I hope that this report helps you in deciding if this car seat is right for you and your little one. The soft part of this car seat can be removed and washed in the machine or by hand. If there is one thing that can get dirty pretty quickly, it is a child's car seat. This is especially true if your child will be eating and drinking while traveling in it. Parents liked that this car seat is machine washable. It also can be washed out by hand. This car seat comes equipped with an easy to use latch system that includes a tether. This allows for easy installation and movement between multiple vehicles. Some car seats are hard to install. That doesn't seem to be the case with the Evenflo Maestro Booster Car Seat. Parents seemed to appreciate that they didn't need to take all day getting it in correctly. One parent said this about the installation, "The seat was extremely easy to adjust for everything on it. The straps slid so smoothly, but once they were locked in place that car seat literally is not going anywhere. I got it out of the box, adjusted, and installed in less than an hour." 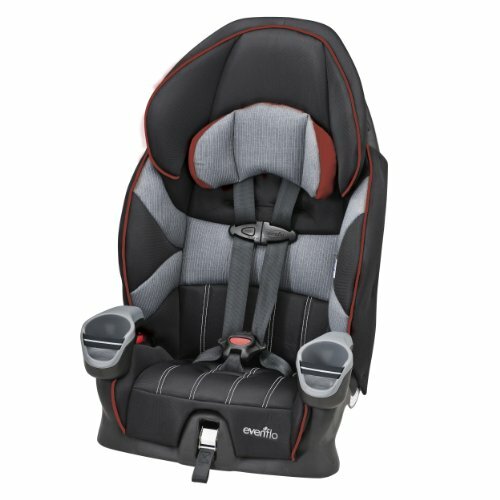 The Evenflo Maestro Booster Car Seat is priced to sell. This is probably why there are so many reviews, since so many have bought this seat at a great price. One parent said what many others, were saying about the price, "I bought this seat for my almost three year old son and wow - it is a nice seat for the price! " Many parents left great reviews about how this car seat is easy for traveling with. One summed up what a lot of others are saying by leaving this review, "Excellent seat at fantastic price. Bought two of these to travel with on plane and in rental car for our 3 year old twins. Light weight, comfortable for kids, and easy to install. I figured at this price that this seat would be difficult to install and get tight with no movement. I was wrong, installed on the first try in rental car and it was super snug...no movement." This customer went on to say, "I used the travel car straps to attach to our roll luggage and our twins loved riding through the airport. Went on the plane without difficulty and kids were more comfortable on the plane because of it. Not to mention they were safer sitting in it. Will use this as a second set of seats in other car when not traveling." "We were involved in a complete rollover after our 12 passenger van hit black ice. 7 of our 10 children were riding in the van at the time. The other 3 were with my parents. 4 of our children were in this seat I had just purchased a couple months prior. The seats never moved during the roll and they had no major injuries or marks whatsoever!! Just 1 small cut to the forehead due to shattering glass from the window she was sitting next to. Our 1 year old baby was rear facing in an Evenflo Tribute and came through without a single mark! During the roll the windshield, all left side windows, and rear window shattered. Our van was completely totaled." The EvenFlo Maestro Booster Car Seat seems to be a great car seat for a low price. It's not only passed all of the required safety standards, but it also has exceeded them in several areas. People who were in crashes have verified that this is a very safe seat to trust with your little ones. The ease of cleaning and travel, makes this car seat even more valuable. Parents seemed to especially like how easy it is to install. This is not one of those car seats that will require incredible strength and a lot of time for installation. After reading the reviews, I can't see how you can go wrong by purchasing this car seat. To check out the rest of our car seat reviews, click here.